When I think of chicken, I think of Foster Farms. The bright yellow logo reminds me of shopping at the grocery store with my mom and dad as a child, spacing out in the meat aisle, asking for everything, and often getting shot down. 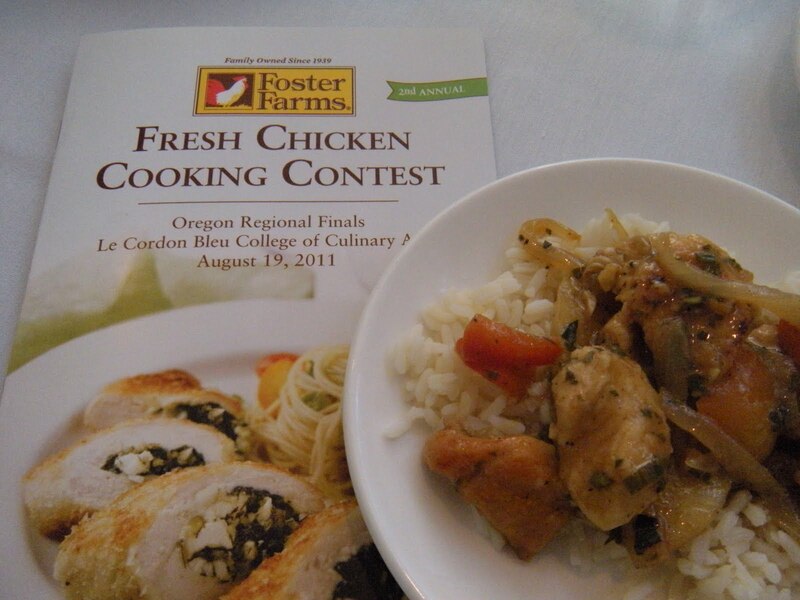 I was invited to be a part of their 2nd annual Fresh Chicken Cooking Contest in Portland as a guest of Jennifer Heigl from Dailyblender.com. We’re Twitter pals, and until yesterday we’d never met face-to-face.I showed up at Le Cordon Bleu early, and found many nice people from Foster Farms and the culinary institute there to greet me. They explained that the contestants (there were five of them) would have approximately 90 minutes to complete their dishes, at which time the judges (there were four of them) would be presented with their plates. At the same time, all of us in the audience would sample each dish recreated by the LCB chefs, and we would have the chance to vote for the People’s Choice Award. Winner winner chicken dinner! Or breakfast. Whatever. Recipes included Pan-Fried Chicken with Blueberry-Pinot Noir Sauce and Goat Cheese Polenta (Timmy Baker, Eugene, OR), Hazelnut-Sage Chicken with Ravioli (Mary Lou Cook, Welches, OR), Chicken Mushroom Ragout (Megan Futrell, Hillsboro, OR), Crispy Basil Skinned Chicken Breast with Peach Pink Peppercorn Compote (Russell Kool, Hillsboro, OR), and Stir-Fried Chicken with Walla Walla Onions and Hood River Pears (Deb Stoner, Oak Grove, OR). 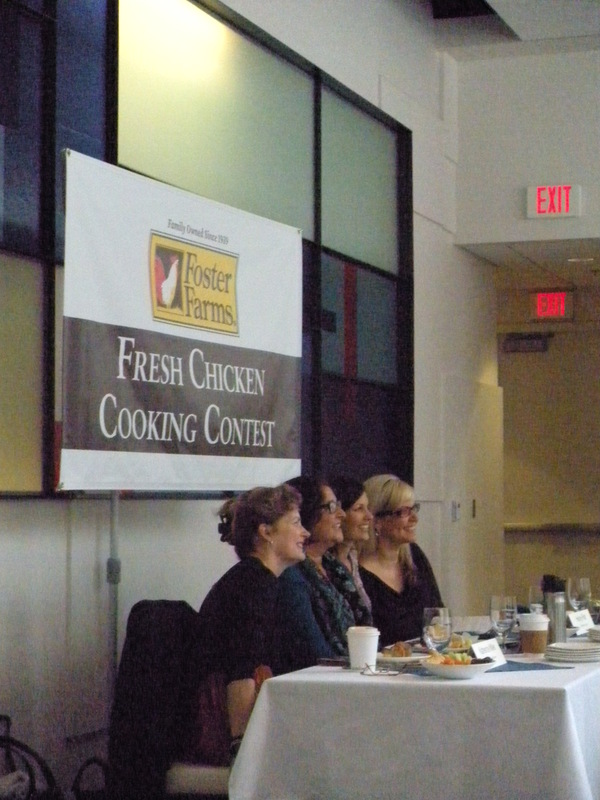 Each of the contestants were tasked with creating recipes that used local ingredients, and of course, the common thread was Foster Farms chicken. This was the Oregon State finals, and the two winners will go on to join the winners from Washington State (crowned last weekend) and California (crowned next weekend) at the finals at the Culinary Institute of America in Napa, CA. 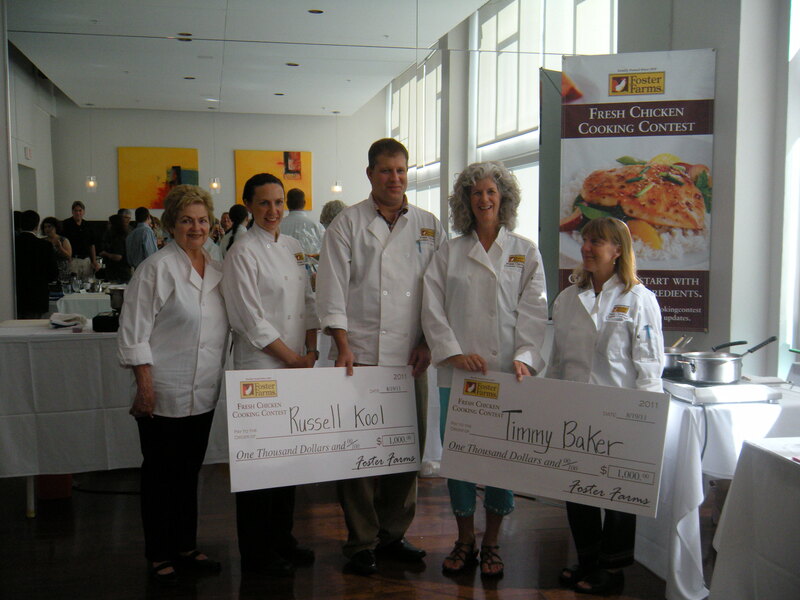 Foster Farms received more than 2,000 recipe entries, but yesterday, the Publisher’s Clearinghouse-style $1,000 checks would go to Timmy Baker and Russell Kool for their dishes. The People’s Choice Award went to Megan Futrell. 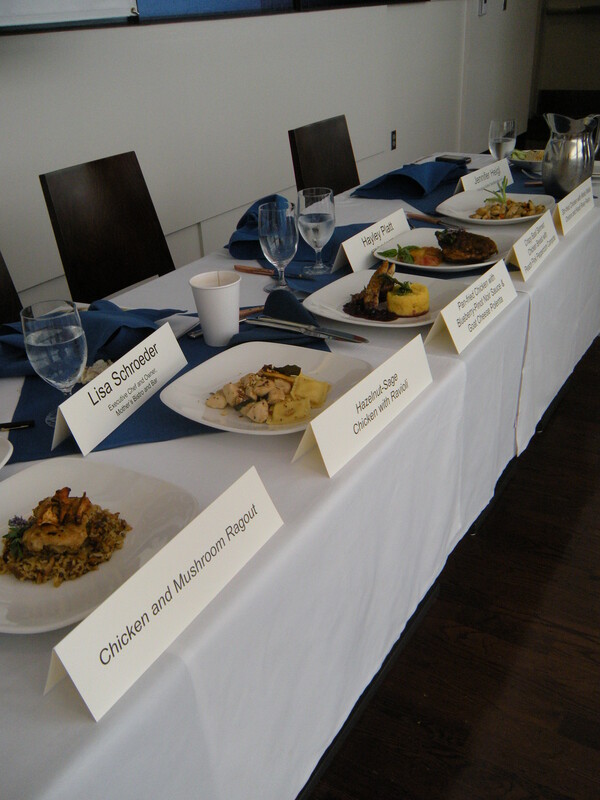 The judges looked at presentation, originality, ease of recipe, use of local ingredients, and execution, and each contestant did a wonderful job touching on each category. All of the recipes were easy, and many of the judges commented on that aspect during their explanations. They must have had a hard time deciding, because they deliberated for quite awhile before issuing their decision. Ironically, (I say that because they were both Oregon State contestants last year) Baker and Kool were the cream of the crop. They were the only two repeats in the entire tri-state competition, proving they can bring the heat year-over-year. I never imagined myself devouring chicken dishes at ten o’clock in the morning and liking it, but the event was fabulous and I’m so glad I went. A special shout out to Jennifer Heigl for having me! For me, the winning dish was the Crispy Basil Skinned Chicken Breast with Peach Pink Peppercorn Compote. It’s not really shocking; I’m a sucker for crispy chicken skin morning, noon, or night. The compote was tangy, sweet and could stand up on its own, and I’m planning to make a corn meal pound cake to pair it with, as it almost had a dessert-like quality and texture. If you’re interested in any of the recipes from the contest, I’m willing to relinquish them and help you share in the chicken bonanza. Just send me an email. I also have the recipes from the 1st annual competition because I’m just that lucky (thanks Toby!). Best of luck to the Oregon constituency in Napa at the end of September! If you need someone to pack your knives, carry your whisks, or act as paparazzi, I’m shamelessly offering my services to tagalong. It’s the kind of person I am; a chicken-loving groupie, and I like it that way. Posted in Cooking Competition, Culinary, Recipe, Uncategorized. Bookmark the permalink.